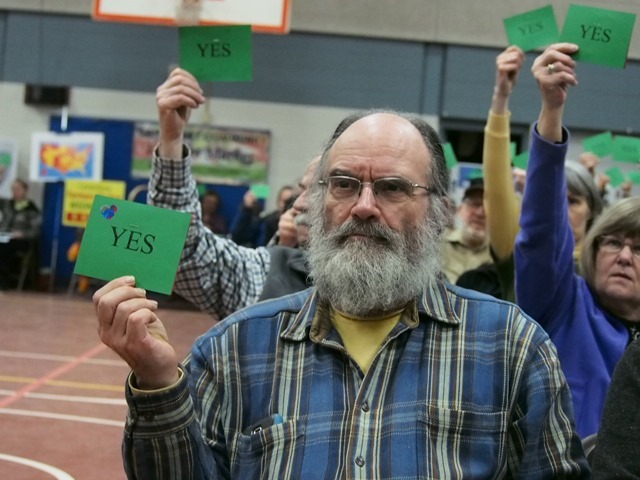 Following an unusually placid series of votes approving budget items, Canterbury, New Hampshire’s annual Town Meeting came to life during a debate over a resolution calling for a Constitutional Amendment that would overturn the Supreme Court’s “Citizens United” decision. but not unprecedented, she said, and it is our duty as citizens to take action. Rep. Moffett’s statement elicited a invitation for him to elaborate on his concerns and a request for information about how the resolution had been drafted. Rep. Moffett spoke again briefly, and I addressed the origin of the resolution and its relationship to others being considered all over the country, which together can create a groundswell of pressure on Congress to act even if they don’t share the exact same wording. Another voter asked about corporate personhood, which brought Laurie Lockwood to the microphone again for a short history lecture. Finally Judy Elliott took the floor. “We want to make it clear that corporations do not have the right to spend unlimited money on elections.” That was the last word. 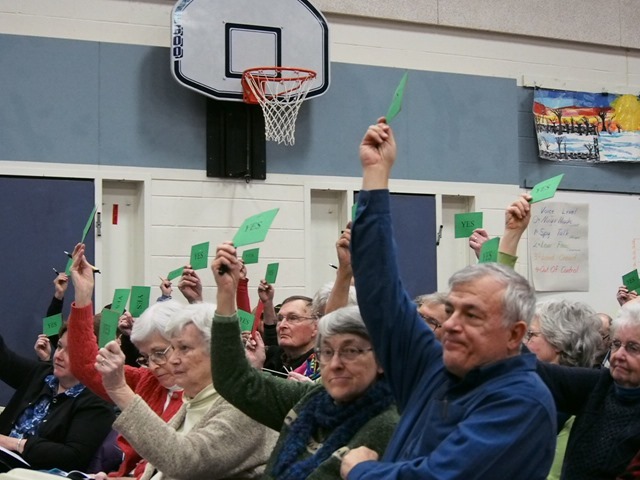 Wayne Mann, the town’s Moderator, called for a vote, which in Canterbury is conducted by voters waving a green card for “yes” or a red card for “no.” There were a few “no” votes, but no doubt that the resolution had the overwhelming support of the citizens present. 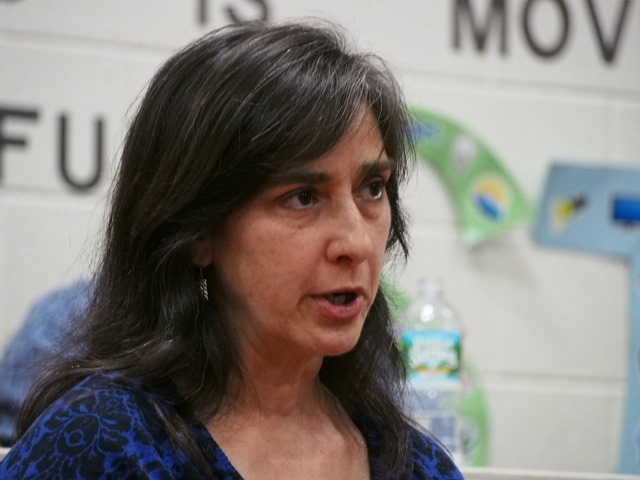 The vote followed weeks of organizing by a small, informal committee of Canterbury residents who worked together to draft the resolution, collect petition signatures, organize an educational program at the library, and talk up the issue in town. Canterbury now joins dozens of other New Hampshire towns, and hundreds across the country, that are calling for the Constitution to be amended. Disclosure: the photos of people voting were taken during earlier votes, not the vote on Article 9, the resolution on Citizens United. Writing in the New York Times, Thomas Edsall assembles an impressive array of facts that illuminate the realities of wealth inequality in America. Citing Federal Reserve figures, Edsall reports that household net worth, corporate profits, and the value of real estate have been going up at an impressive pace. If you think that sounds like evidence of recovery you’d be mistaken, at least if you equate “recovery” with economic conditions that are improving for most workers. For answers he turns to a bunch of economists, who provide data about tax rates, labor force participation, the declining growth of well-paying jobs, globalization, and the reduction of labor’s share of profit relative to capital in a time of rising productivity. My answer is a bit more straightforward: America’s companies and company owners — the small group of Americans who own and control America’s corporations — are hogging the political system. This is nothing new, but in the legal environment created by recent Supreme Court decisions (Citizens United and McCutcheon in particular) it is becoming easier for corporate interests to wage class war and win. Simply put, the people who make the laws and set the policies have their receptors tuned to the frequency where the corporations are broadcasting. Edsall notes survey data that reveal corporations are not so popular in the USA and other so-called “advanced countries.” He asks if the legitimacy of free market capitalism in America is facing fundamental challenges. My gut response is to say “I hope so.” But the dynamics described by all those economists are not the workings of “the invisible hand.” The market is operating under a set of rules established by those who already have more than their fair share of power, wealth, and privilege. The legitimacy of our corporate-directed political system must be challenged as well.